Do you work with dogs? Does your lifestyle through work and social activities regularly place you in contact with unfamiliar dogs? We provide Bite Prevention and Safe Dog Handling workshops for dog industry professionals, outdoor workers, schools and community groups. Each course is specifically tailored to the individual needs of the group. What to do if attacked and injury minimisation. Training is conducted using highly trained dogs. 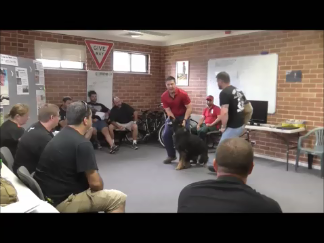 We are able to travel statewide delivering these workshops at your location or they can be conducted in-house at Total Dog. © 2017 Total Dog. All rights reserved.